It's hard to believe in this day and age we are still dealing with the issues of racism. Considering the current political climate, it's enough so that we need another movie to hit us over the head with this country's shameful civil war history. The pockets of resistance in the south to keep that attitude alive and well, will probably not see this film. In fact the basis of this little known story is buried deep and covered up in Jones County, Mississippi. 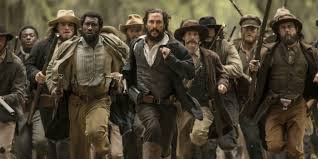 Director/writer Gary Ross (Seabiscuit) did massive research to tell the tale of Newton Knight who deserted the Confederate army and led a Unionist rebellion. Clocking in at 139 minutes, it does seem incredibly long at times, but the performance by McConaughey seems to be bidding for Oscar nod at the end of the year. Newton Knight (Matthew McConaughey) was a farmer in Jones County, MS with his wife Serena (Keri Russell). The film opens with Knight removing the wounded from the battlefields in 1862. The horrific slaughter is enough to turn anyone's head around. He's not happy with the idea that has to fight a battle to protect the rich cotton plantations and for them to keep their slaves. He becomes even more angry when the 20 Slave Law protects the rich whites by exempting them from being conscripted. The last nail happens when his young nephew is killed in battle, so he takes his body home to his mother, deserting his unit. Back home he sees the unfair tax system strip farmers of everything they own leaving them only 10% of their crops to survive the winter. His attempts to help puts him on a wanted list for sedition and treason, so he hides in the swamp with some runaway slaves. Frightened Serena leaves their farm with their child in tow. Meanwhile Newt has taken up a friendship with Creole house slave Rachel (Gugu Mbatha-Raw) who brings them supplies and news. And Newt teaches her to read. As the war progresses, Newt who had become friends with runaway slave Moses (Mahershala Ali), begins to harbor more deserters in the swamps. Newt's natural leadership skills and fired up activism creates an army of sorts to defend the local farmers from being robbed by the taxmen. They call themselves the Free State of Jones County. Soon they number in the hundreds supporting themselves with the help of the local community and by robbing the supply trains. The area commander retaliates by burning farms and Newts burns their cotton. The heartbreak and struggle is a hard toll on Newt. The second half of the movie deals with the aftermath at the end of the war. As the slaves are freed, the southern plantation owners find different ways of keeping them working. The promises of 40 acres and a mule are quickly dissipated. Rachel encourages them to move to Soso as the Klu Klux Klan begins to terrorize. The side story jumps to the future of 1948 where an Caucasian looking man is accused of being 1/8 black as a descendant of Rachel of Newt and having married a white woman. He's charged with miscegenation and subject to jail time. Which seems unbelievable nowadays, but there are people who still adhere to it's stupidity. The present day Jones County who still think Newt was a deserter and reprobate, are more upset that he mixed the color lines with his half breed children. There's a lot of history to tell, it's slow, and somewhat depressing. The movie does it's best to cover most of events, but Newts speeches to fire up his followers are the only insights to his emotional connection to what drove his passion. The supporting cast while good, are only given short drift to support Newt and his agenda. It's still an important story that needs to be told and hopefully there will come a time when it won't be necessary.